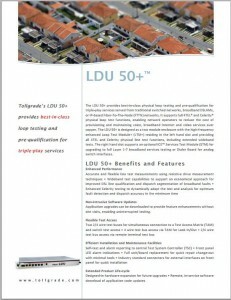 Tollgrade’s LDU 50 provides best value physical loop testing for triple-play services served from traditional switched networks, broadband DSLAMs, or IP-based Fiber-To-The-Node (FTTN) networks. The LDU 50+ provides best-in-class physical loop testing and pre-qualification for triple-play services served from traditional switched networks, broadband DSLAMs, or IP-based Fiber-To-The-Node (FTTN) networks. 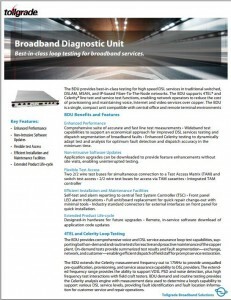 The BDU provides best-in-class testing for high speed DSL services in traditional switched, DSLAM, MSAN, and IP-based Fiber-To-The-Node (FTTN) networks. 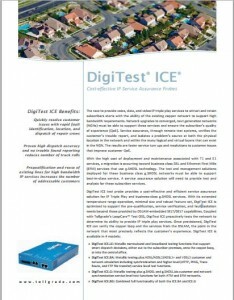 DigiTest ICE test probe provides a cost-effective and efficient service assurance solution for IP Triple Play and business-class g.SHDSL services. 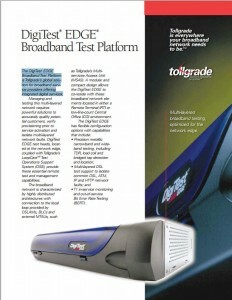 The DigiTest EDGE Broadband Test Platform is Tollgrade’s global solution for broadband service providers offering integrated digital services. 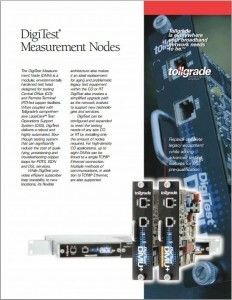 The DigiTest Measurement Node (DMN) is a modular, environmentally hardenede test head designed for testing Central Office (CO)- and Remote Terminal (RT)-fed copper facilities. 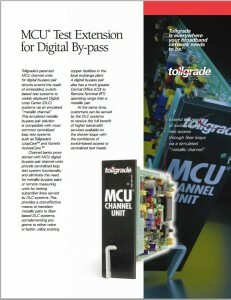 Copyright © 2019 Tollgrade Communications, Inc. All Rights Reserved.